… so the next day, a Sunday, I went up again. Until that point, I didn’t think I had put on more than 3500 m of elevation gain the whole year; within a month, I managed to do it in three hikes. With my experience from the hike up in October and after eating rather well in Nice, I gave myself 3.5 hours on Saturday to get up to the lake. Two hours and fifteen minutes after I started, I arrived under starlight and moonlight, astounded and more than a bit perplexed at how I had gotten back in shape without actually doing anything. On Sunday it happened again. 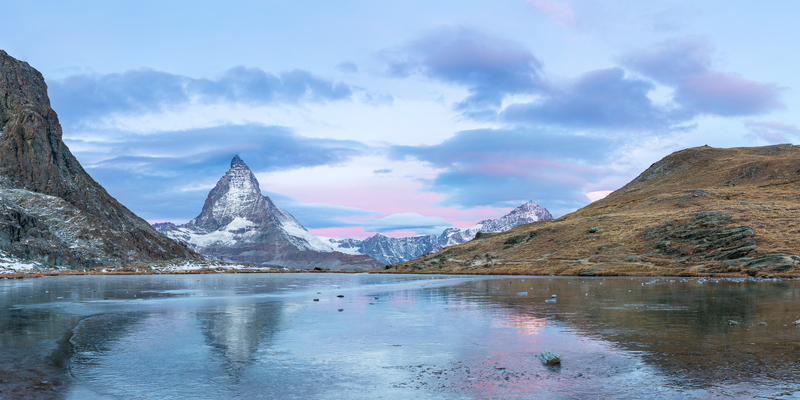 The early arrivals meant I had a chance to warm up in the Rotenboden waiting room and that I could take my time to unpack the tripod and set up the camera, giving me a peek of the scene before the colors started to dance. 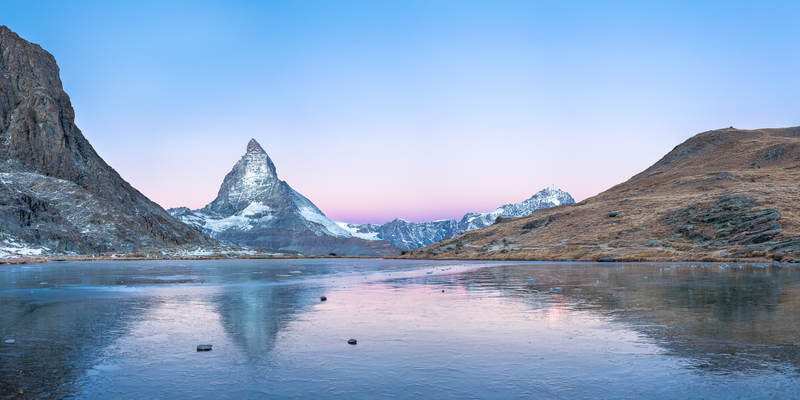 The colors the first morning were almost predictable, to the point that the clear blue sky to the north of the Matterhorn was so uniform that Lightroom thought they were all the same picture, leaving a giant white unstitched gap across the top of the frame. By Sunday, the weather had started to change; winter was coming. It would start snowing Sunday night, and this was actually the very last weekend a snow-free hike up would have been possible. With the clouds came more color — and the surprise of realizing I need yet still to refine my technique. 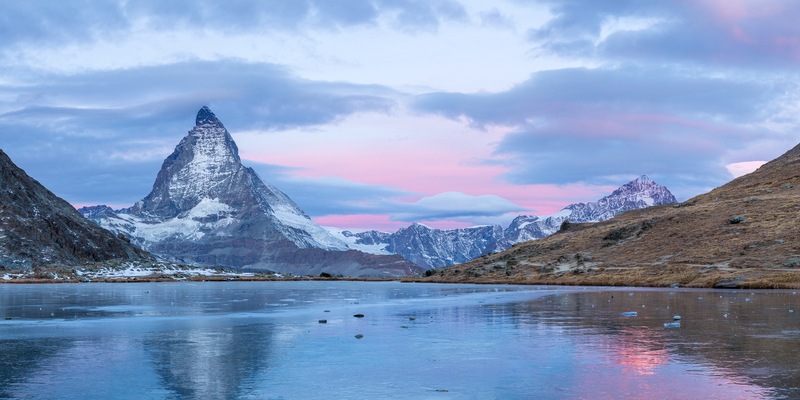 I rotated and clicked away as the sky brightened, noticing the red glow on the Dent Blanche as I spun the camera toward the north in each row of shots. By the time the camera was pointed down to get the lake in the foreground, the Dent Blanche was on fire, but too much time had elapsed between the first image and the last image, resulting in the reflection being much more colorful than the actual mountain. By the time I finished my last set of photos, the majority of the sky had “lost” its color, and the Dent Blanche looked almost pale while its reflection still held some luminance. I must have worked on the image for fifteen hours, trying to see if I could pull or add any more light to the mountain, but I don’t use Photoshop and every attempt looked unnatural. The picture posted here has no saturation added to Dent Blanche and some saturation removed from its reflection; without the realistic color-bomb I wanted, I ended up printing the more natural looking image from the first day at 1.8 m x 0.9 m. The box the picture arrived in was bigger than my front door. Some might find it odd that I still go back to this place. Sometimes, even I still do. It’s remote, requires ridiculous wake-up times for non-mountaineers, is expensive, and doesn’t even guarantee a decent image, but the experience is timeless and, frankly, peerless. 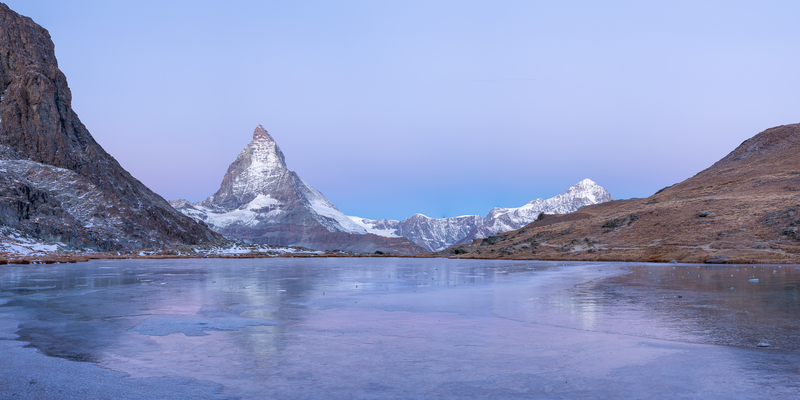 I was the only person at the lake for sunrise on both mornings, and without the trains and lifts running I could hear the pings and echoes of the ice reacting to the load of my tripod. Probably at some point someone has seen the Walliser Alpen in a similar light as what I photographed this weekend; after all, one of my shots from 2015 was incredibly similar to that from Saturday. But every trip up is a little different: the state of the lake’s water, the amount of snow on its banks, whether I got to the lake by train or on foot, the temperature of the air, whether there are sheep grazing nearby. 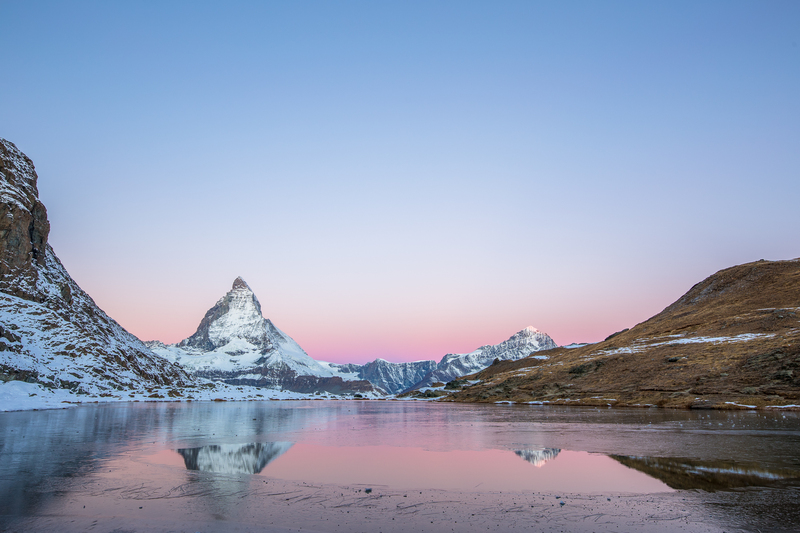 On Sunday, I didn’t see any headlights along the Matterhorn’s Hörnli ridge, and who knows — I might have been the only person in the entire Valais Alps watching the sunrise. Whether I was a photographer those two mornings was almost entirely irrelevant, and whether I got the photograph even more so; simply being there was reward enough. I was so relieved by the ease of the hike up that I forewent even taking the train back down to Zermatt, using the time on the return to collect my thoughts and take in the forest I’ve grown familiar with only by the light of my headlamp. As I crossed an icy patch that in 2011 caused me to rip my pants, I came across a Zermatter and lent him my microspikes to traverse the slope. We discussed the coming weather and where he was heading, then bid farewell and went our ways. I wandered around the village for lunch and for dinner accidentally stumbled across what immediately became my favorite restaurant. Snow had begun falling that afternoon, low temperatures preventing it from melting out since. 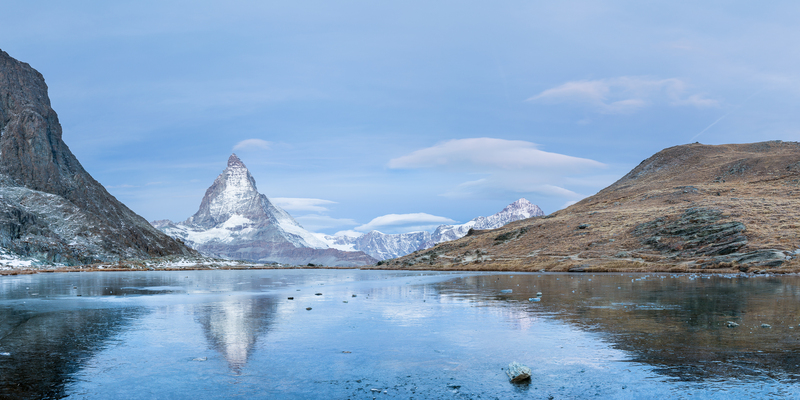 During the second week of January 2018, roughly two meters of snow fell in Zermatt in 24 hours, ensuring that the only way to get anywhere above the village is by mechanized lift, skis, or snowshoes. I doubt that no one has seen a sunrise at the lake since, but knowing that I am among some few who have is still difficult to fathom. In a corner of my bedroom, the picture still leans against the wall; I haven’t figured out a way to hang it without some serious concrete patchwork when I move out. In spite of not really having a good solution for how to hang simply a fifteen pound picture, though, I’m completely convinced I’ll be back for more. The more I go to this area, the more I realize: there is nothing I know outside of Mt. Rainier that feels quite like this. And it’s clearly not because of the photographs I take there.